This mob spawns at -260, 1180, -250 on the third level and roams.. This page last modified 2018-01-08 06:27:46. Drops Vile Substance, as listed. Your faction standing with Clan Runnyeye has been adjusted by -1. Your faction standing with Storm Guard has been adjusted by 1. Your faction standing with King Xorbb has been adjusted by 1. You receive 3 silver and 8 copper from the corpse. He was targettable on a ramp but even sitting on him I could not hit him or cast on him. Could not sic warder on him either. Shrugs. Edit: found another one in a hall. targettable but not attackable. Bugged I would say. Message is that I can't see him. Saw this bad boy on the 2nd floor tonight... Piece of cake for my warrior. Leave this guy to his work of cleaning goblin and newbie guts off the floor if you are looking to make a vale sewing kit. Instead, head over to High Hold Keep. Check the merchants (or ask the players) for large bricks of HQ ore (or any size, really). The NPC standing next to the forge in the druid area (not the vale forge) in Rivervale sells chisels. A chisel and a large brick of ore turns it into a small brick of ore. A small brick on ore turns into 2 small pieces of ore. Then find the vale forge, which is near Silna Songsmith (The wood elf bard) and make your sewing kit. Cause he does clean up, while you clean out the mobs! BUT - you DO WANT to kill him. Since he does SOOO much cleaning, he drops a throwable item. Know what that item is used for? Take the REGEN OFF of the Lord! So... Kill the Janitor a few times and keep those throwing items for the Lord! It knocks off the regen and takes HP from him. OH - if your wondering what the lord dropped, he dropped a few items - the best one being: Blackened Alloy Coif. Don't kill him! I give him "High Fives" as I wander through the place cleaning it out. He cleans the floor, I clean out the mobs. We make a good team. He's just a janitor. He only works there. How can you justify killing him?? I like to sterio type. he is a goblin, and so is evil. being a follower of the tribunal, I believe he must die for his evils. I agree. Starting a petition not to kill the Janitor guy!! He's lazy too, there's slime all over and goblin pies laying around. What union is he in? Proc causes target to get smacked in the face with a wet, dirty mop and then start running away, and does about a 50 disease dot, but that's just me. LOL! 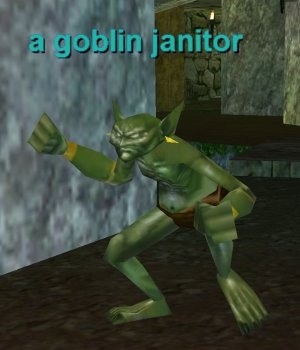 Goblin Janitor?Whats he do mop u to death?LOL!